Since many of us were obsessed with all things British last week, I thought I would share a recipe for something British – scones. The scone is a small British quick bread of Scottish origin. My favorite scone is the Orange Scone sold in a certain popular coffee shop chain. I cannot justify buying high-priced coffee much less scones so I resorted to researching recipes until I came up with this version which I think comes very close to the those that I love from the coffee shop! 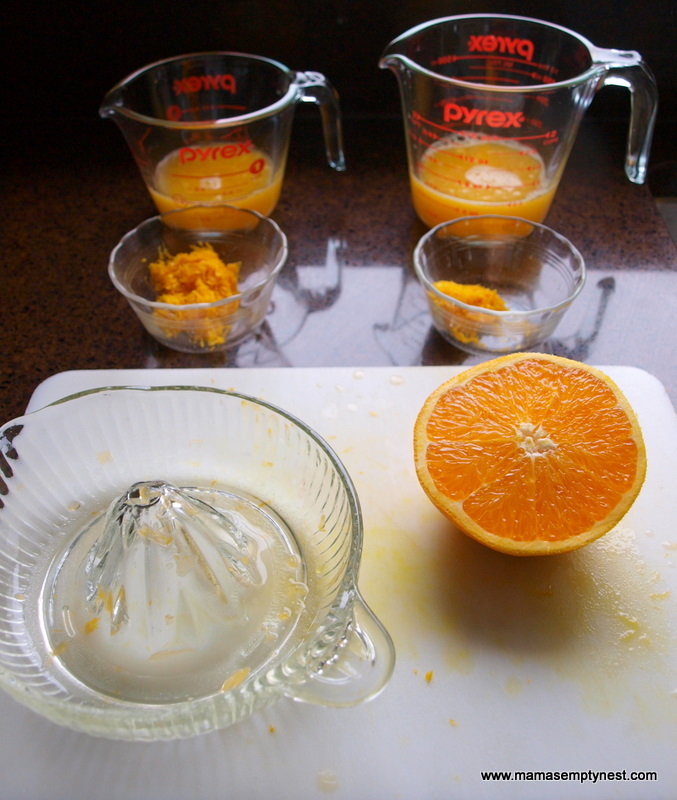 Using fresh oranges is necessary because you will need the zest, but I have used orange juice out of a carton, too. These oranges were huge and on sale, too! They made this batch very orange-y. You will need 1/2 cup of juice and 2 TB of zest for the scone batter, and you will need 2/3 cup of juice and 1 TB of zest for the glaze. Combine your wet ingredients – orange juice, buttermilk, egg, and orange zest. Set aside. 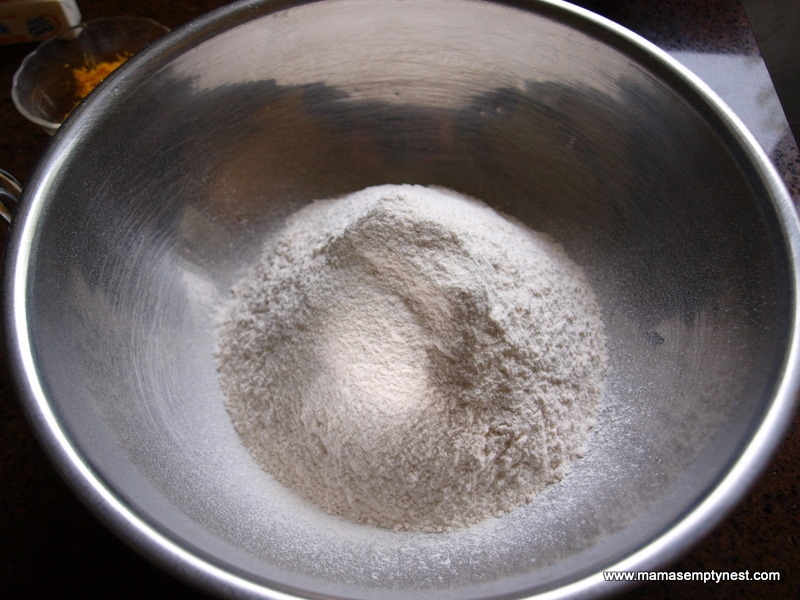 Sift the flour, sugar, baking powder, and salt into a large bowl. Cut the cold butter into pieces into the dry ingredients. It is very important to use cold butter and work quickly. You do not want the butter to get soft. 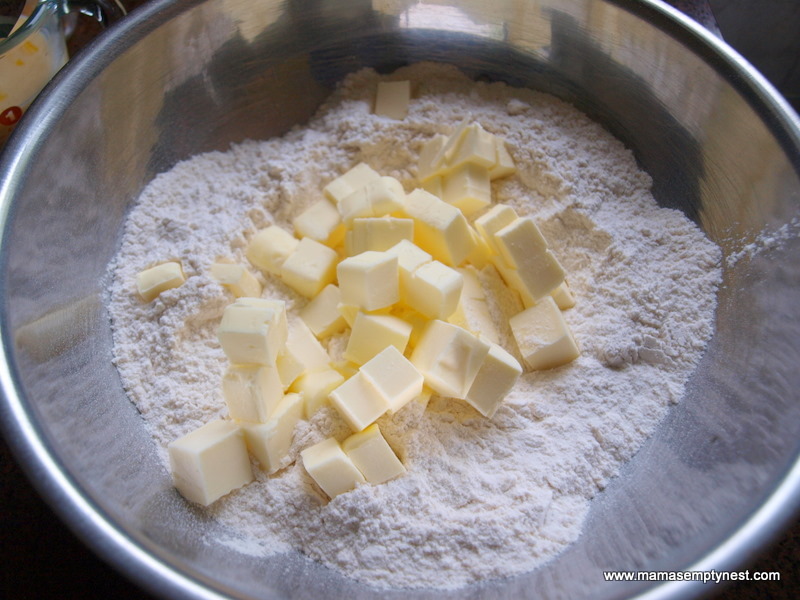 Using a pastry blender or two knives, cut the butter into the dry ingredients until it resembles coarse crumbs. Again, work quickly and do not allow the butter to get soft. 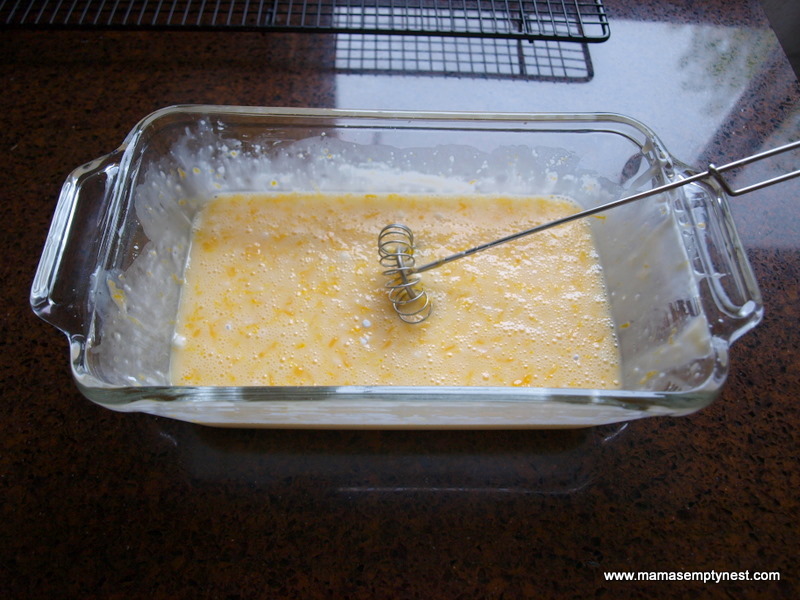 Add the orange juice mixture and mix together quickly just until combined. The mixture will be crumbly. 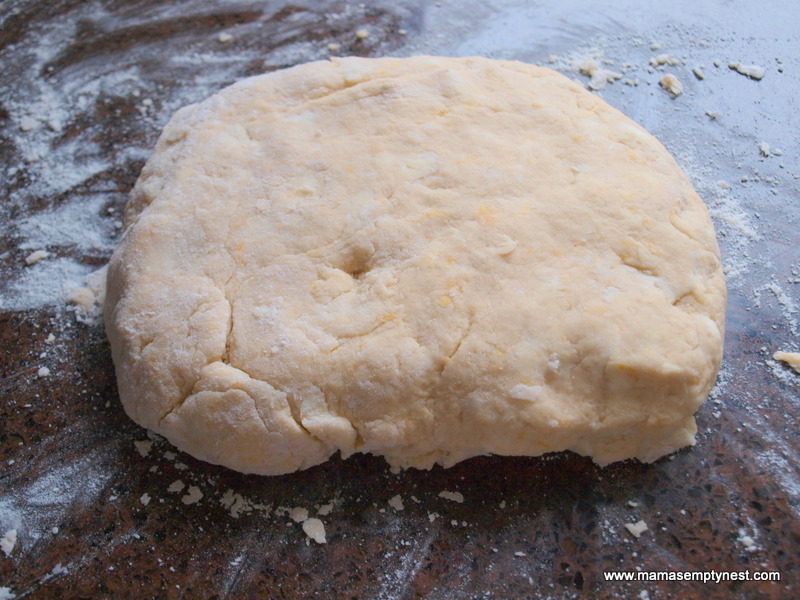 Turn out onto a floured surface and knead gently several times just until all the dough holds together. It will still be somewhat crumbly. You should still be able to see some chunks of butter. Roll into a rectangle. Dough will be 1/2 to 3/4 inches thick. Place the scones onto ungreased pans. This is about the only time that I use airbake pans. You can also use cookie sheets that are doubled up or pans with parchment paper. You want these to bake, but not get browned – kind of like shortbread cookies. Bake for 18 minutes, remove from oven, and gently place them onto cooling racks. They will be tender, but they will firm up once they completely cool. Put the powdered sugar, orange juice, orange zest, and salt into a glass dish and stir until smooth. Add additional sugar or liquid until you reach the desired consistency. Dredge the completely cooled scones in the glaze and allow to set completely. 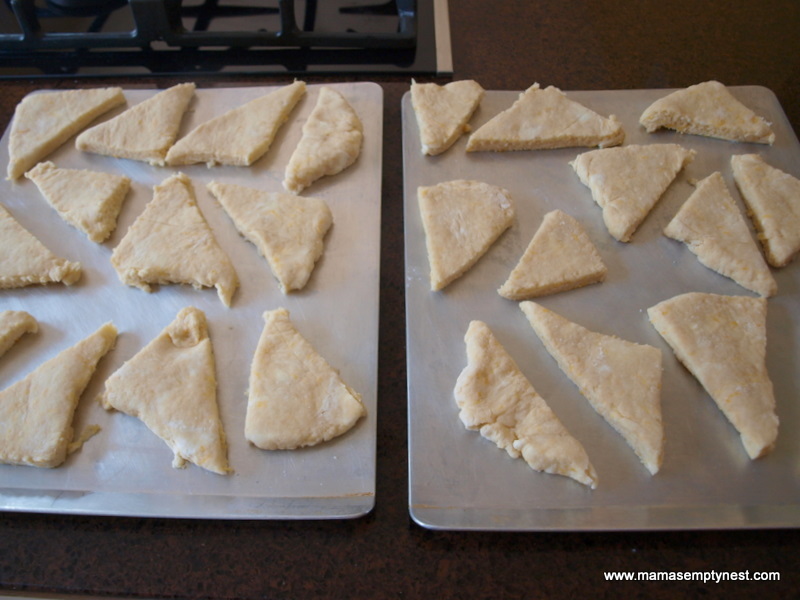 I dredge the entire scone – top, bottom, sides – in the glaze and put back onto the cooling racks to set. You may want to put some waxed paper under the racks since the glaze will drip off the scones. These are very orange-y and yummy! 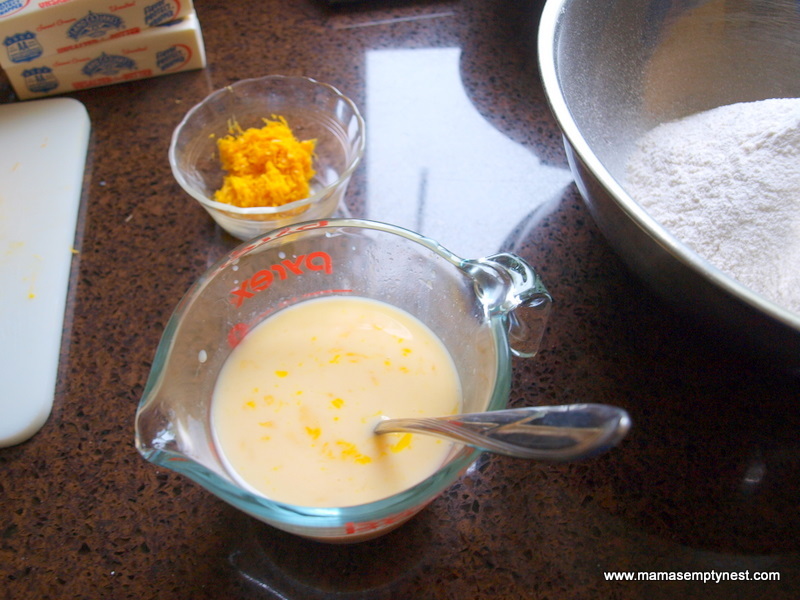 To make the scones, combine the orange juice, buttermilk, egg, and orange zest. Set aside. 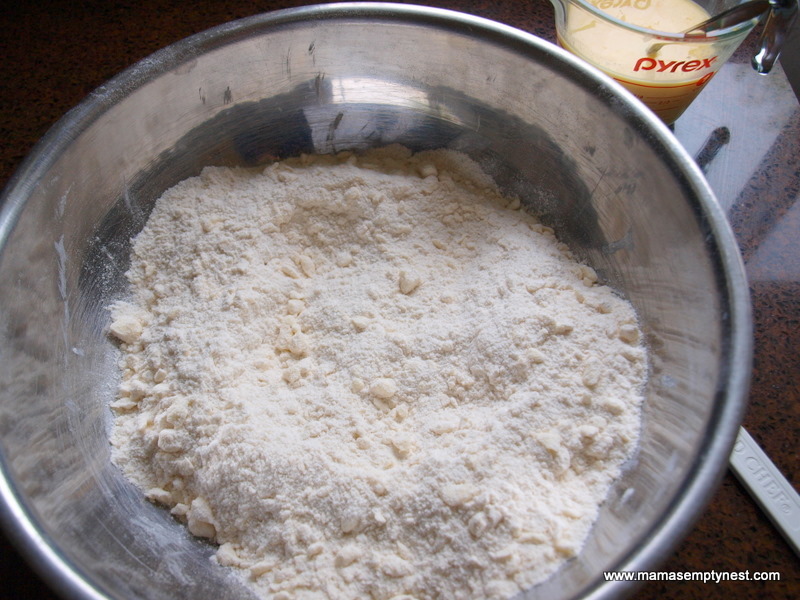 Sift together the flour, sugar, baking powder, and salt. 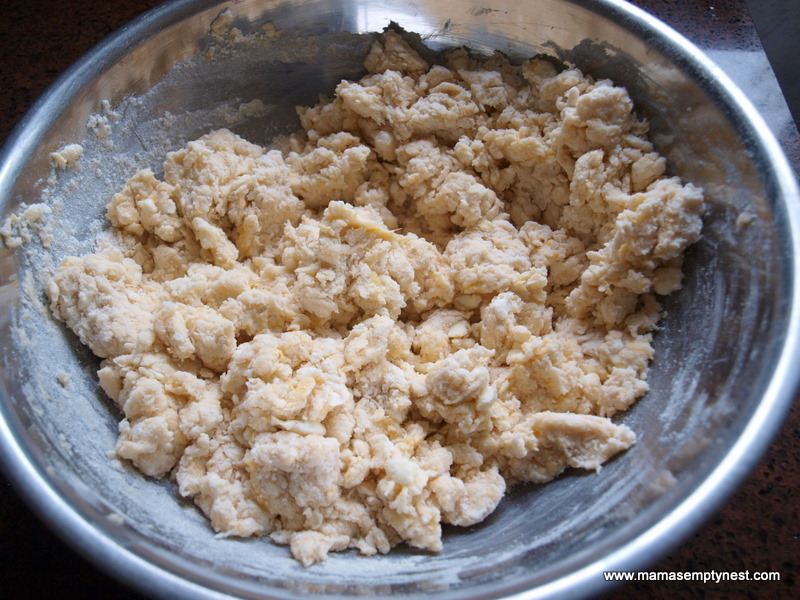 Cut in the cold butter until the mixture resembles coarse crumbs. Stir the wet mixture into the dry mixture until it comes together. 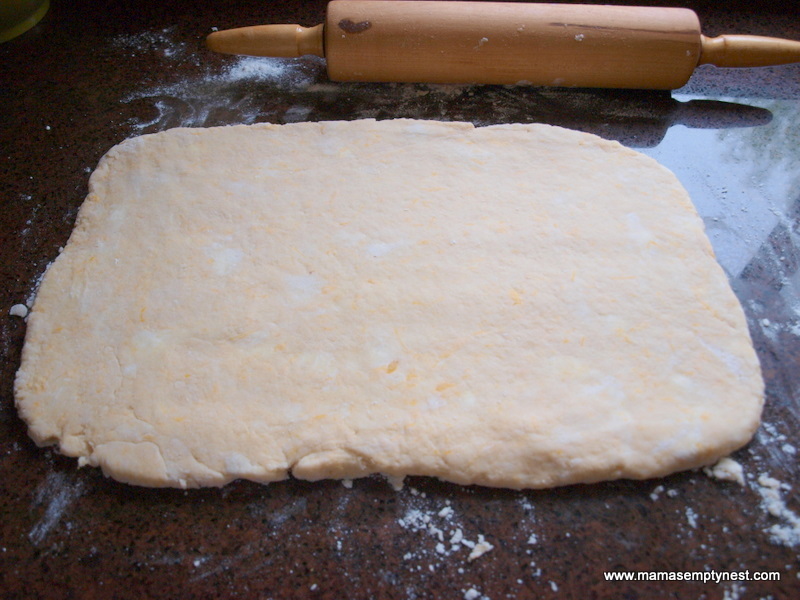 Turn out onto a lightly floured board and knead gently 5 or 6 times. 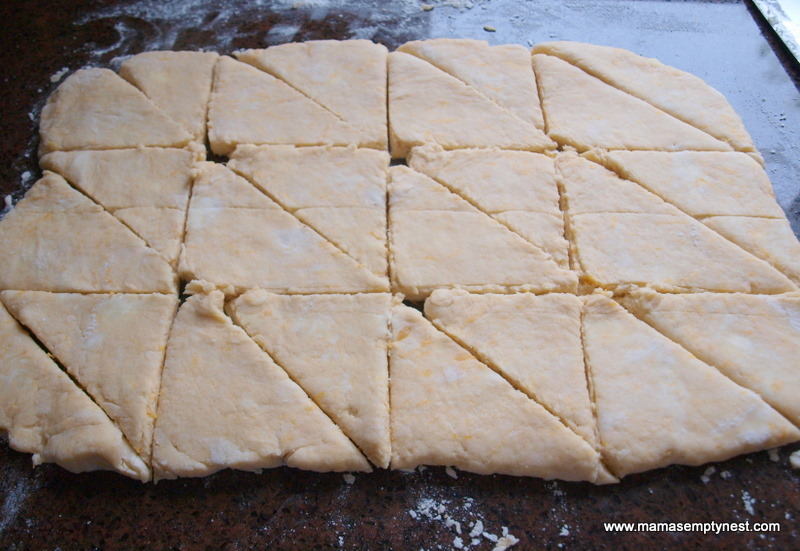 Pat or roll dough into a rectangle and cut into 24 triangles. Place onto air bake pans, double layered flat cookie sheets, or pans with parchment paper. Bake for approximately 18 minutes. Remove to cooling racks to cool. 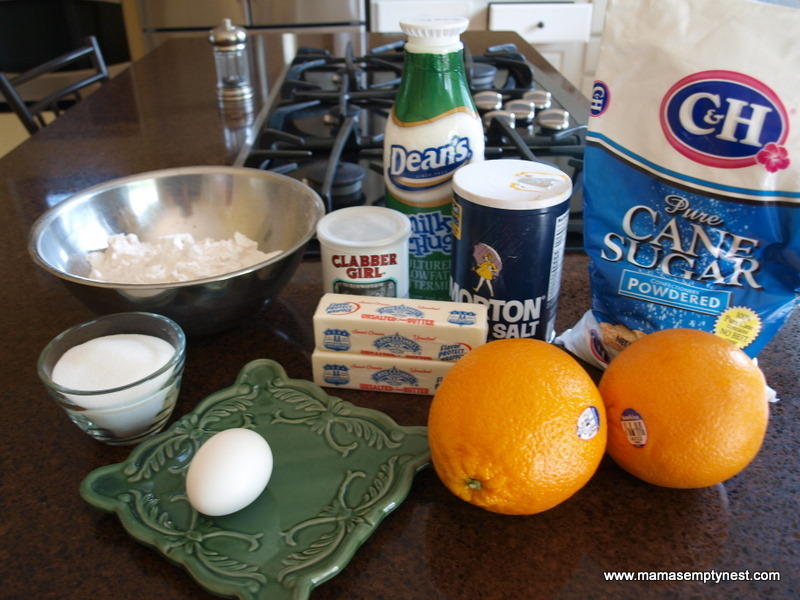 To make the glaze, whisk together powdered sugar, orange juice, orange zest, and salt until smooth. Adjust sugar/liquid to reach desired consistency. Dredge completely cooled scones in the glaze and allow to set completely. This entry was posted in Food & Home and tagged Breakfast, Quick Breads. Bookmark the permalink. Thanks! I played around with this recipe for awhile and I think they are a worthy knock-off. Hope you enjoy them – they are one of my favorites! I’ve made these scones a few times. They are always delicious, but they spread instead of rising. I think the next time I make them I’ll add an extra half cup of flour. I may also divide the dough in half and pat each half out into a circle on the baking sheet and cut the circles into wedges, baking without separating the wedges. Hopefully, that will keep them from spreading too much. Thanks for the recipe. They really do taste very much like Panera’s Orange Scones. We have enjoyed them very much. Thanks for visiting and commenting. Let me know how your adjustments work! I will try this also. I love these scones and worked hard to replicate the Panera recipe. One of my favorites. 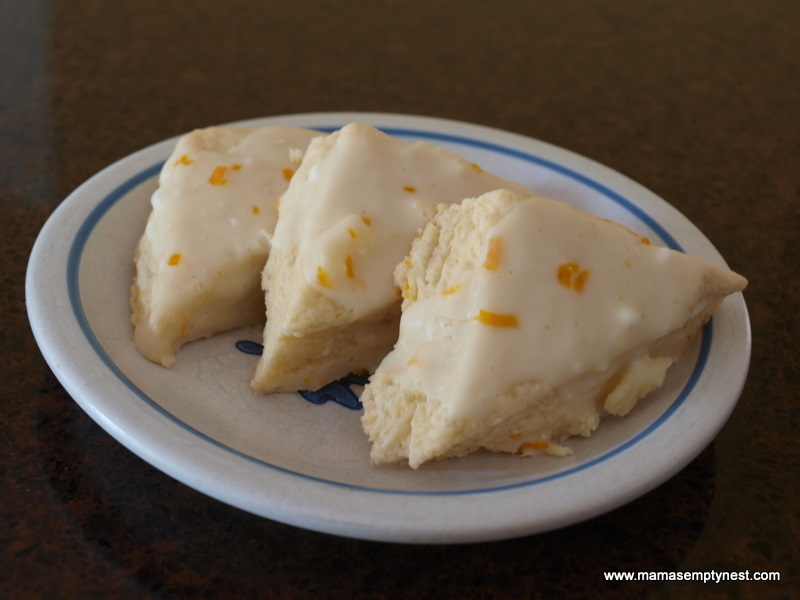 My wife and kids don’t agree that these are just like Panera’s Orange Scones. To quote our youngest child, “Dad, we think your Orange Scones are way, way better than Panera’s ’cause they’re not as dry and crumbly”. I must agree that these are better than Panera’s. Thanks again for sharing the recipe. I’ve made these several times now! I did start adjusting the butter to 1 1/2 sticks as they kept melting and spreading. I’ve been trying different scone recipes, but just keep coming back to this one as my favorite–thank you so much for sharing! I haven’t had much trouble with spreading, but I often tweak recipes. I’ll try both suggestions by my recent commenters. concentrate for the Orange juice and lemon zest the same did Orange zest..I may have to tweek the sweetness…your thoughts?? I would just use lemon juice from the lemon with the lemon zest. You’ll have a lemon anyway. I would try it without adding any extra sugar. 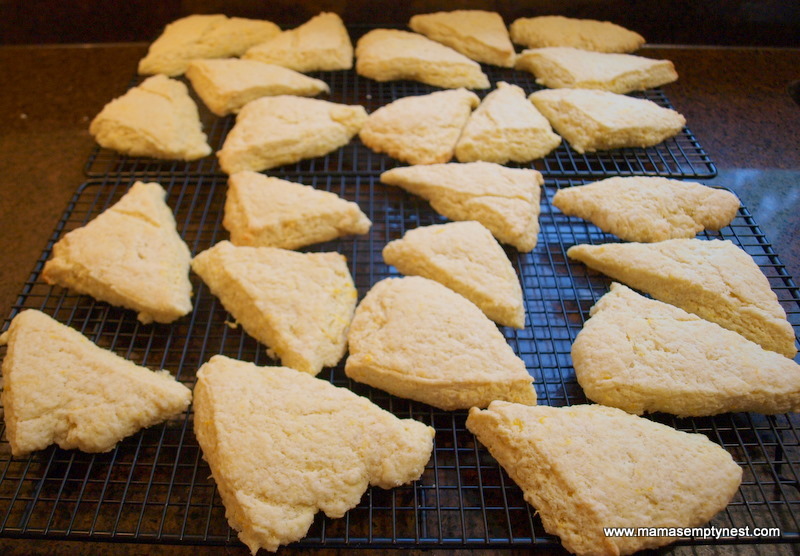 If you read the comments, many people find these scones a little too soft and they spread when baking. They still taste great, but many have had success adding a little extra flour. I love orange scones, and I bet the lemon will be great too. Adding a few blueberries with the lemon also sounds yummy! Would love to know measurements of the rectangle you roll or pat out before you cut into 24. I eyeball a rectangular shape making sure the scone is thick enough.